Join us all month long on Fridays at 4pm as well as in the drop-jar on the desk as we serve Don’t Shoot PDX, right here in Portland. SINCE 2014, WE HAVE SEEN A RISING OF ACTIVISTS, FAMILY MEMBERS AND CONCERNED CITIZENS ACROSS THE COUNTRY COMING TOGETHER IN THE NAME OF COMMUNITY OUTREACH IN AN EFFORT TO CREATE SOLUTIONS FOR THE CURRENT ISSUES OUR WORLD FACES TODAY. 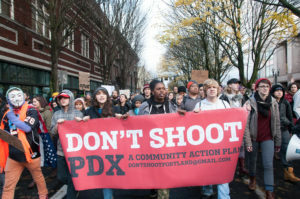 CONNECTING THROUGH GRASSROOTS EVENTS HAVE HELPED MANY TO SHAPE TOOLS FOR ACCESSING A VOICE IN COMMUNITY OUTREACH WITH POLITICAL POWER AND INFLUENCE, THESE INCLUDING NON-VIOLENT DIRECT ACTION AND PROTEST. OUR REGIONAL AND DEMOGRAPHIC RELATIVITY TO THE EXPERIENCES IN OUR COMMUNITY HAVE FORCED US TO UNITE AS ACTIVISTS AND SOCIAL ADVOCATES FOR YOUTH, FAMILIES AND VULNERABLE COMMUNITY MEMBERS. OUR ORGANIZATIONAL WORK AND ACTIVISM, INCLUDING DIRECT COMMUNITY EDUCATION WORKSHOPS, SUPPORT THE OUTREACH OF OUR CONTINUED ADVOCACY AS FIRST RESPONDENTS AND HAS HELPED COMMUNITY MEMBERS CONTRIBUTE THROUGH DIRECT ENGAGEMENT AND LEGISLATIVE VALUE. THERE ARE A VAST AMOUNT OF POLICY BASED ASSETS INFLUENCED AND BEING HARNESSED IN OUR STRATEGIC BUILDING OF RELATIONSHIPS AND NETWORKS USED TOWARD THE SHIFT IN CULTURE AND SYSTEMIC DISCRIMINATION. ACTIVISTS FROM THE FRONT LINE NEED TO BE ENCOURAGED TO CONTINUE FRANK AND HONEST CONVERSATIONS ABOUT OUR CONNECTION WITH FERGUSON AND RACE IN AMERICA AND ITS INFLUENCE WITHIN POLITICS. KNOWN FOR OUR BYSTANDER INTERVENTION WORK AND COMMUNITY ADVOCACY ITS WITH GREAT PRIDE THAT IN 2018 WE MOVED OUR ORGANIZATION INTO A SPACE IN A GENTRIFIED NORTH PORTLAND NEIGHBORHOOD. THE WOODLAWN MIC IS LOCATED AT 1425 NE DEKUM AND AS A HOME TO DON’T SHOOT PORTLAND IT WILL HOUSE OUR PROGRAMMING AND COMMUNITY RELATED EVENTS.